Greenville is a perfect city to walk and bike to just about everywhere, except the zoo. There is the occasional bike traffic. When you can’t walk somewhere and need to drive (i.e.,the zoo), there is plenty of parking available inside the Main Street area and outside. Saturday is one of the best times of the week to explore Greenville because of the city's Saturday Market on Main Street. Greenville’s Saturday Market is only open May through October. Children 2 and under can visit the Greenville Zoo for free. 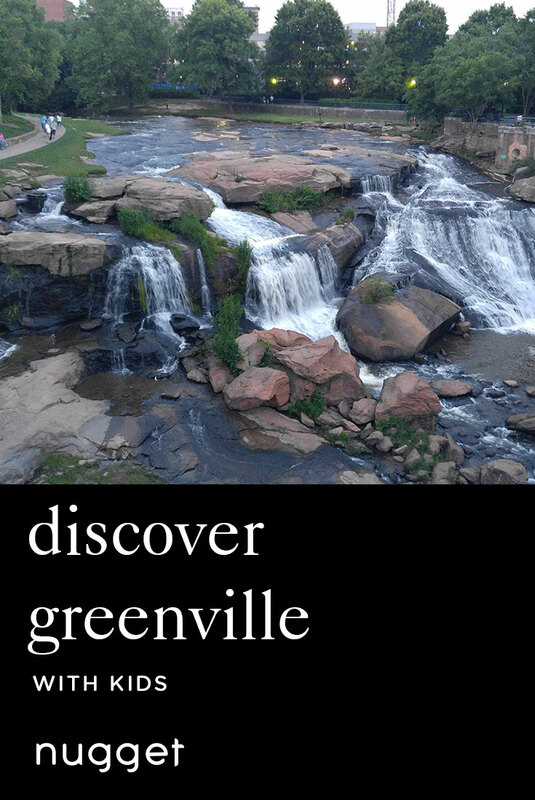 What to do in Greenville with kids? Enjoy a Saturday outdoors and explore Greenville, South Carolina’s small-town flair and local adventures. Savor the fresh organic produce and handmade offerings at Greenville’s Saturday Market before eating brunch at Nose Dive, one of the most kid-friendly restaurants in town. Then, go out to Falls Park to look at the waterfalls and talk to the ducks. Finish the day visiting all the farm animals and baby animals in the Greenville Zoo. It’s the perfect size to entertain kids before they get bored. And, if your kids are not tired after all that, the zoo’s playgrounds are still another chance to drain their energy before dinner time! With parks and benches to rest your feet and countless fun water features throughout your city walk, there’s always something more to discover as you walk to your next destination! The Saturday Market is lined with local vendors offering fresh organic produce. There are also countless vendors offering homemade soaps, beautiful artwork and more. My nuggets loved walking (and running) through the market. My 5-year-old daughter especially loved all the fresh produce (since she loves fruit). DIRECTIONS South Main Street is easily accessible from a lot of the hotels that are located downtown, off of River Street and Main Street. The market starts at South Main Street and East Broad Street, and continues north up to North Main Street. TIP The Saturday Market is a very popular attraction that only happens on Saturdays and only from 8 a.m. to 12 p.m. Keep small children close. There are countless restaurants that line South and North Main Street, so they’re right there anytime you want to stop and eat. Nose Dive was incredibly family friendly. Paper and crayons were given to my nuggets to keep them entertained while we waited on the food. Their Saturday brunch is very popular. My 4-year-old son is vegan, so I brought his food with us and they were incredibly understanding (they even offered to heat up his food in their kitchen)! We sat in the main dining room, which has large windows that were opened up to the beautiful Saturday Market outside. The food was amazing. The pancakes and fresh fruit were a hit with my daughter. DIRECTIONS Nose Dive is located right on South Main Street, close to East Broad Street, so it is extremely accessible from the Saturday Market. TIP There is inside and outside seating. I saw families seated outside. Next time, I’ll make sure we’re outside. Since we were coming from the market, I did have my large stroller (that can fit the car seat). It fit in the main dining room and the restaurant manager was okay with it, but because it was so large, I felt like it was constantly in the way. It didn't stop traffic, so that was good. Falls Park on the Reedy is like nothing we've ever seen before. The falls are beautiful. There are ducks coming in and out of the water. The surrounding area next to the falls is extremely hilly. The kids loved playing tag and rolling down the hill. DIRECTIONS From Nose Dive, head south on Main Street toward East Broad Street. About a half mile down the road, cross the Reedy River (looked almost like a stream when we were there). The entrance to Falls Park will be on the left, just pass Spill the Beans, a coffee and creamery shop. TIP There is mostly foot traffic around the falls. There is a suspension bridge that is pretty high, so be cautious if your children are afraid of heights. In the summer evenings, there’s Shakespeare in the (Falls) Park, which every child should see at least once. Greenville Zoo is the cutest little zoo, nestled right inside the adorable Cleveland Park neighborhood. My nuggets loved this zoo because of the farm animals they could feed, the two small playground areas that were featured inside and all the baby animals; there were so many baby animals (i.e., baby giraffes, cats, and monkeys)! The cutest little zoo, nestled right inside the adorable Cleveland Park neighborhood. My nuggets loved this zoo because of the farm animals they could feed, the two small playground areas featured inside and all the baby animals; so many baby animals (i.e. giraffe, cats, monkeys). One of the best features was just outside of the zoo. Two large playgrounds, both catered to a certain age group, await your nuggets if the zoo hasn't totally drained them. There is still another chance parents! DIRECTIONS From Falls Park, hop in the car and take East Broad Street toward Cleveland Park Drive, which takes you directly to the zoo. It's about a 10-minute or less drive from Falls Park. TIP There is a small place to get food, but I would recommend packing a lunch. There are tables and benches just past the lions (or before, depending on which way you go.) If your kids want more playtime, there are two large playgrounds just outside of the zoo. WE LOVEDLarge room. Perfect location to S. Main Street and only a few blocks from Falls Park on the Reedy. WE DIDN'T LIKEThere was a party on the roof and it got loud for awhile. The party ended at 10 p.m. thankfully. TIPThere is a pool, so bring your bathing suits! It's an Embassy Suites and they're known for their free (included) breakfast. It was wonderful.